RIT researchers are identifying creative and innovative ways to mitigate food waste. It’s estimated that as much as 40 percent of edible food in the United States ends up in landfills. RIT researchers have a full plate when it comes to identifying creative and innovative ways to mitigate food waste. The stakes are tremendous. Faced with a growing world population and a shrinking pool of natural resources, the world today faces an unprecedented challenge to provide a resilient food supply—made even more complex by vast inefficiencies and resulting food waste generated across the food supply chain. 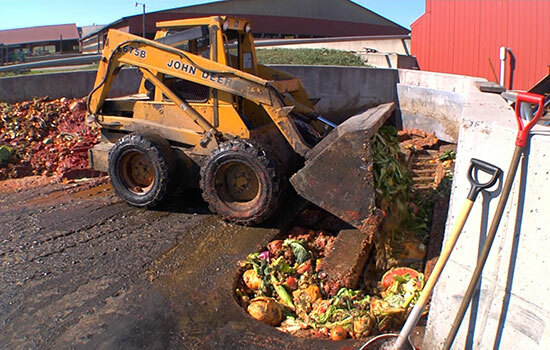 It’s estimated that as much as 40 percent of edible food in the United States ends up in landfills. The Golisano Institute for Sustainability (GIS) is employing food waste treatment technology and equipment in its new food waste utilization testbed—the goal of which is to share results with businesses—by using excess food from RIT’s dining halls. Thomas Trabold, associate professor and sustainability department head at GIS, is leading a team of researchers studying how best to optimize fermentation growth parameters in the production of filamentous fungal mycelium—used by therapeutic New York state mushroom producer Empire Medicinals, based in Rochester, N.Y. The yearlong project is studying the potential of GIS’s commercial project partner using excess whey—a common waste product in the yogurt industry—in a stirred tank reactor as a production resource for the commercial mushroom industry. RIT researchers also are conducting an economic assessment of whey and its scalability as a food waste “upcycling” and re-use alternative to wastewater treatment for the New York state dairy industry. “Companies seem to be coming to the understanding that materials that were once considered waste can now be a resource converted to secondary products,” Trabold said. The research is made possible by a nearly $50,000 grant from FuzeHub, a not-for-profit organization that provides small- to medium-sized manufacturing companies in New York state with guided access to a network of technical and business resources. New York state companies also are turning to the New York State Pollution Prevention Institute, headquartered at RIT, which is working closely with the state Department of Environmental Convention on multiple efforts to reduce the generation of food scraps and recycled food scraps that remain through programs that will help food waste generators expand their sustainability efforts. Meanwhile, Callie Babbitt, an associate professor at GIS, is nearing the midway point of a nearly $1 million award from the National Science Foundation researching sustainable solutions for minimizing and managing the growing and complex challenges of food waste generated across the food supply chain. The four-year project involves an interdisciplinary research collaboration with faculty from five RIT colleges. Babbitt’s research team is studying how innovative technologies, waste management systems and policies can reduce the volume and environmental impacts of food waste—while at the same time create economic growth and maximize efficient use of energy and water resources. Trabold and Babbitt both were invited by technical publisher Elsevier to co-edit a new book this year titled, Sustainable Food Waste-to-Energy Systems. The book features chapters on the latest developments in anaerobic digestion, bio electrochemical and thermochemical conversion technologies, along with policies related to food waste management and analyses of environmental and economic aspects of waste-to-energy systems. It also includes contributions from current and former GIS Ph.D. students as well as researchers from leading universities.